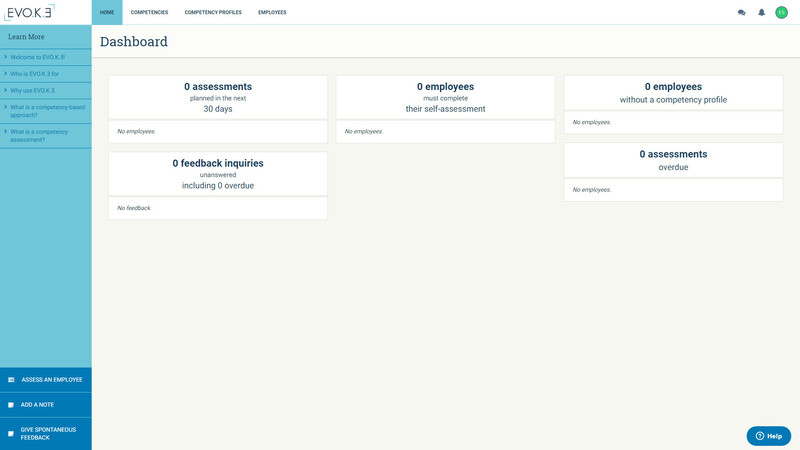 Create your competency profiles and assess your employees using EVO.K.E! A competency profile is used to ascertain the important elements to be considered when meeting a candidate or contemplating internal movement. Use EVO.K.E to create interview questionnaires to assess each required competency. Select the interview questions that best suit your situation among the three that are proposed. With a competency profile, you can measure an employee's performance based on essential criteria for the position. This is an opportunity to provide feedback to the employee in terms of what is appreciated and what should be improved. EVO.K.E enables you to assess employees in accordance with the skills required for their respective positions. Levels of proficiency provide supervisors and employees with a clear definition of what is expected. Following the assessment, employees may have to improve certain competencies. With EVO.K.E, you can create an individual competency development plan (ICDP) for each employee. For every competency in the lexicon, it offers concrete ways to help managers and employees develop the ICDP. A competency-based compensation system focuses on establishing employee compensation in accordance with the progression of their competencies and performance. 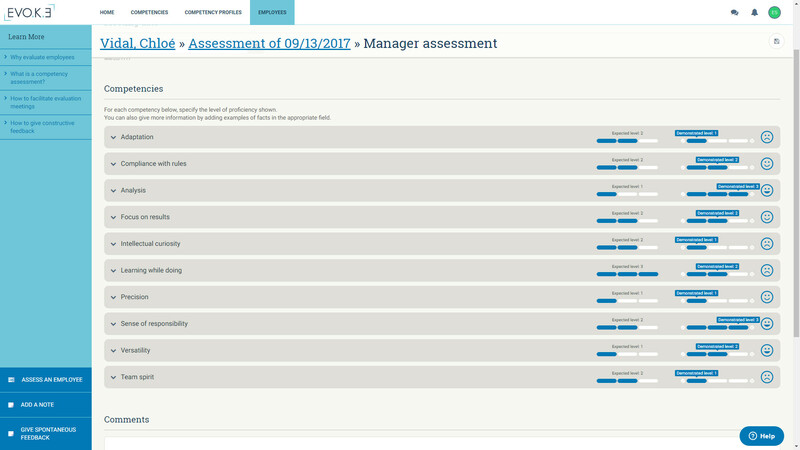 Combined with competency assessment and development, this compensation system enables you to identify objectives and clearly communicate them to your employees, as well as how to meet those objectives and how they will benefit. Boost employee performance and engagement with this system! Drawing up competency profiles provides an overview of the organization, highlights missing skills and determines short, medium or long term gaps between needs and available resources (employees). Then you'll be ready to take whatever steps may be required to fill that gap. 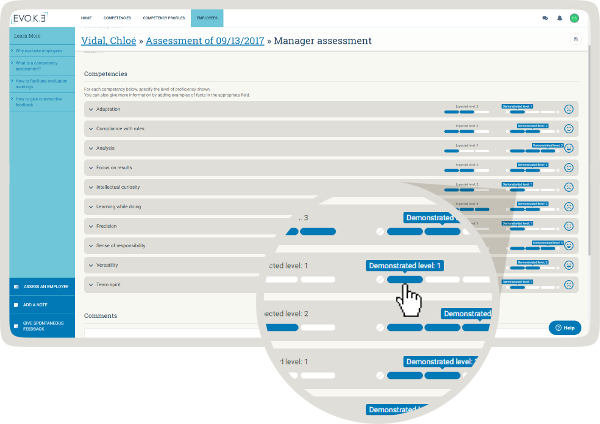 Competency profiles make it easier to identify the employees who could fill a key vacancy in the future. These individuals could be selected based on their current competencies and potential to develop in line with the competency profile of the key position. It helps identify which of your employees' competencies are essential to the success of your organization. 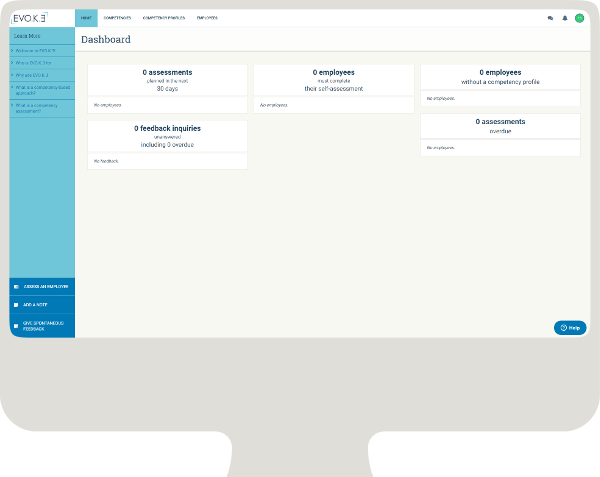 Then it offers simple, convenient and effective tools to recruit, assess and develop your employees.